The armor worn by the Undead Knight which represents the player character, seen in trailers and various forms of media in regards to Dark Souls 2. It likely is going to be the iconic armor of the game just as the Fluted Armor was in Demon's Souls, and the Elite Knight Set in Dark Souls. The armor features fur and a coat which has its own physics and will authentically react to movement and the environmental conditions such as wind. It appears to have a chest plate though the legs are mostly unarmored. The helm is a barbute helm, the ridge on top of it also resembling old forms of rank among warriors. Due to its use in what gameplay has been seen and lack of leg armor it very well may be considered only medium armor. This armor currently is associated with the Warrior starting class, because of this it may actually be called Warrior Armor. At this time it is not known. (Piece) blessed by the war god Faraam. These (piece) are in the style of the Lion Knights, a once-mighty order from Forossa. Although the Lion Knights wore heavy armor, they were feared for their nimble two-handed swordplay. The Knight Set from Dark Souls looks to be returning with a similar look. As seen in the trailer there will be figures wearing White Masks that may work against the protagonist. Often players can wear the armor sets of humanoid enemies so this is a likely candidate for armor the player can wear. If one notices the mask is porcelain like Cirian's mask. Another notable trait is that the set looks to be made of black leather with a shoulder piece making it resemble the Black Leather Set of Patches the Hyena and the Thief Class. 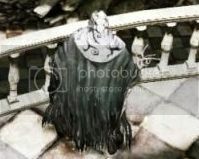 A ragged set of clothing has been seen in screenshots with what looks to be a catalyst in the player's right hand denoting a possible relation to sorcery. This is the starting set for the Sorcerer class. Has the power to resist fire. Pyromancy was developed over time through practice of the Art of the Primordial Flame by the pyromancers who inherited this art. One screen shot features an undead wearing Leather Armor similar to the set from Dark Souls with a hat like that which belonged to Pharis. It is possible the player can attain this set. 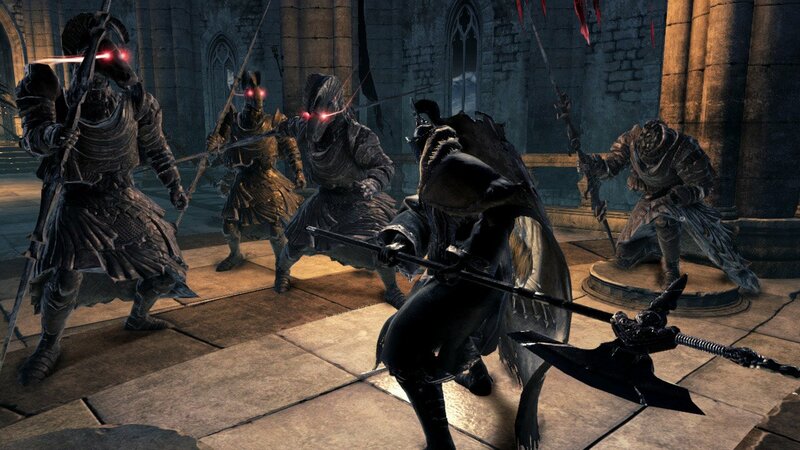 The armor set seen on this enemy is similar to the one associated with the Hunter Class, but the actual armor more resembles the Leather Set seen in Dark Souls. It also is accompanied by what appears to be a Pharis Hat. (Piece) made from soft leather. A commonplace piece of armor. These (piece) are favored by hunters due to their light weight. A commonplace leather hat with a feather. Favored by hunters skilled with a bow, this hat was based on the one worn by a folkloric master archer whose name is now lost to time. There is a set of armor associated with the Temple Knight, it appears to be a set of robes with a large white cloak along with a metal helm. This helm slightly resembles the Iron Golem Helm with it also looking a bit like it is made of Silver. This set is lightweight with darker robes and a gray/white cloak. (Piece) worn by the Silverdrake Knights of Lindeldt. Though little is truly known about the order, it is said that their well-honed miracles and unwavering loyalty in the face of death made them worthy rivals to this country in their day. The armor associated with the Dual Swordsman class, it is a set of tight black clothing with a hood and tights. This set highly resembles the Black Cleric set from Dark Souls. (Piece) worn by the great sorcerer Straid. Straid was a sworn brother-in-arms of the ancient king of old Olaphis. Together, they slew the Ancient Dragon, and tasted omniscience. However, even the renowned wisdom of Olaphis was not enough to control the peculiar magic birthed by his arts. A dark set of bulky armor with what appears to be black padding and leather for the body with an iron cage like helm. Helm Description: A traditional Dranleic Helmet. Granted only to knights whose loyalty was recognized by the king. Vendrick was just a king. He gave high-ranking appointments to knights who demonstrated both valor and charity, and helped lead his country to prosperity. This equipment is evidence of his great feats. Amor / Boots / Gloves Description: Armor reinforced with rare Geisteel. Excellent defensive gear that is both light and sturdy. Crafted by the master smith Llewellyn. Easily identified by his unmistakable trait of discarding any ostentations, focusing solely on an economy of simplicity and strength. 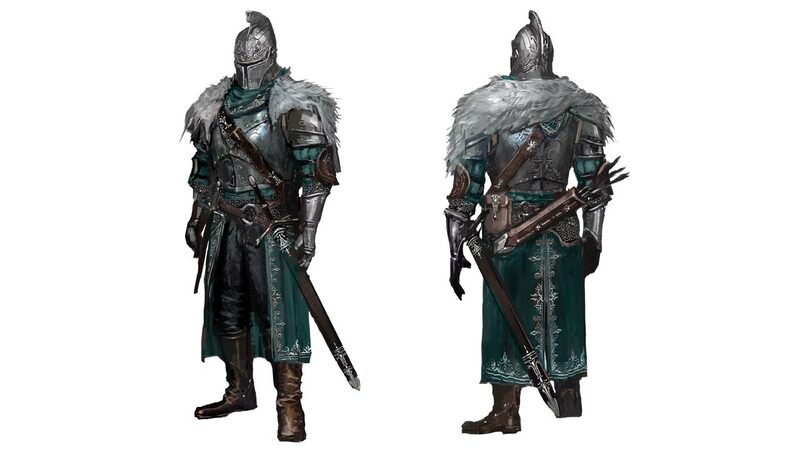 As is shown the Wanderer set may be returning to the game, it looks very similar to its Dark Souls counterpart. Metal (piece) worn by knights. Despite the thin metal used, the grooved texture gives it added protection. Many knights favor this (piece) for its refined craftsmanship, and its like has been passed down the generations. wear this set and may even be able to loot it from the corpses of certain enemies. 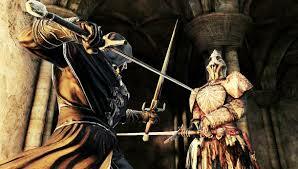 Various undead which have been shown wear armor that is old and dark with a helm and other pieces that resemble the Paladin Set from Dark Souls. The Paladin Armor in Dark Souls had a connection to Thorolund and was worn by Paladin Leeroy, the first Undead member of the Way of White. A set of armor seen currently only in a screenshot. It slightly resembles the shaman outfit from Demon's Souls with a hood and more layers. A set of armor which is believed to drop from rogue-like enemies in game, similar to the hollow thieves of Dark Souls. This set looks to be dark brown in color with a hood and is mostly made of ragged old clothing. The set of armor that Gren drops. Blessed with the protection of the war god Nahr Alma. These robes are much heavier than they look, weighed down as they are by the blood they have imbibed.